We were thrilled to be featured on belleofthecarnival.com today. In our haste and excitement, we failed to edit and re-edit our description so there are a couple of grammatical errors. No biggie, we think you’ll get the gist of it and we’re certain that you’ll enjoy the poem “A Winning Hand”. 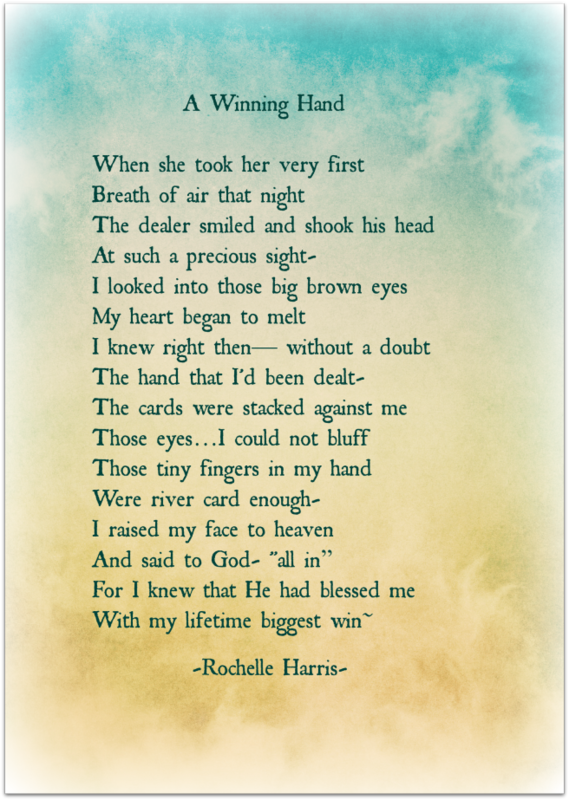 I am overjoyed to share with all of you Rochelle Harris’s warm and touching poem “A Winning Hand” on this Poetry Friday. Runaway Nuns and Leprechauns is a collaborated effort created by me, Rochelle, the primary writer, the jokester and the wild child and my partner in crime, Yevette, the editor in chief, prayer warrior, and resident heckler. I grew up in a very small town in Mississippi. My grandmother was the “Mother” of the Baptist church in our rural community. One Sunday during the Easter season, the Sunday school teachers were assigning parts for the upcoming play. I stepped up and said to the teacher “I want one”. Although I was only 4 years old my grandmother assured the teacher that I was capable of memorizing and reciting a poem.